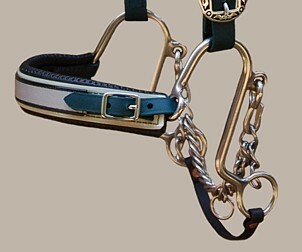 Many of the S Hackamore sets on this page our very custom colors. We can make you one these with colors of your choice. Comes with beta slobber strap, stainless steel curb strap. Shown (left) is the S Hackamore and PVC padded noseband. The noseband is a custom replacement for the rope nose that is buckled on the S Hackamore. It has the soft PVC padding overlaid with black beta. The standard S Hackamore curb chain has been replaced with a stainless steel English curb chain and hooks. S Hackamore metal cheeks are stainless steel. 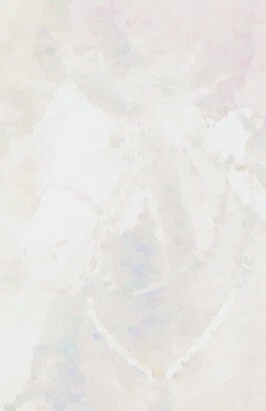 Choose beta color to overlay on black beta on noseband. 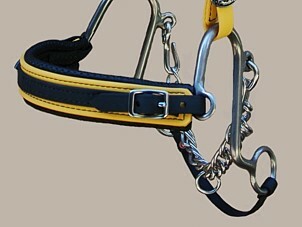 Choose biothane color to overlay on black beta on noseband. Violet biothane/black beta. PVC padded and stainless steel English chain. Please contact us if you would one with a custom color choice. S Hackamores with nosebands come in a variety of colors. The price is the same with the exception of 3 colors: glowbelt, and reflective. The addition of glowbelt or reflective adds $5.00 to your order. 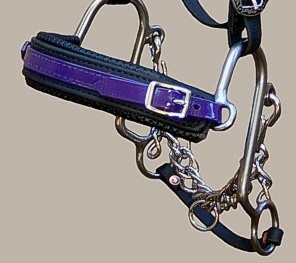 Sizing of nosebands & slobber strap: Most horses take the same size, but we will make custom lengths. Please contact us, if that is what you need. This is a special combination with reflective over 1" Glow Belt over the black PVC padding. The straps are hunter green beta. Any biothane or beta color can be used for the straps. The price includes $10.00 for the Reflective & Glow Belt. Black beta/yellow beta. PVC padded and stainless steel English chain.